Can be modified for vegetarian diets. The crepes themselves are vegetarian. 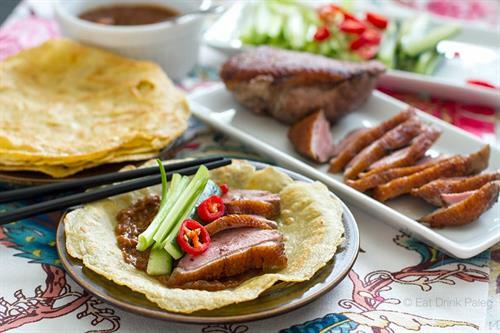 A form of “bing” in Mandarin, mini Chinese crepes are not only simple and easy to make, but super versatile and oh so delicious! Welcome culinary aficionados! Let me introduce myself. Every since I was a little girl, cooking fascinated me. I’ve been making my own dishes since I was 8 years old and still 20 years later, cooking with a passion to experiment. Basing my recipes on all my knowledge of cooking, baking, sauteing, etc etc that I’ve gained over those years, I tend to alter recipes with new ingredients or different portions of those ingredients and encourage my students to do the same - finding their own “style” because what is life but an adventure to be nourished. As the founder of Learn More, Live More (soon to be known exclusively as Seeds Center 1/2018), I am filled with a passion for improvement and sharing my passions with others. Our Intergenerational program provides full-length classes at no cost to our “senior” and “junior” students over many weeks with the spirit of experimentation and exploration. As we grow, we are growing our students as well - enriching every individual we can so that they can all make the world a better place inclusively, connected(ly), positively, and with our last but not least cornerstone - open possibility.